Bacterial wilt | Infonet Biovision Home. Moko disease in banana caused by Ralstonia solanacearum. The pseudostems show brown vascular discoloration. 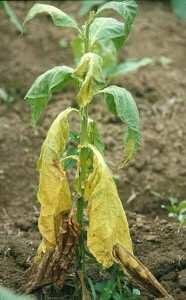 Bacterial wilt symptoms on tobacco plant. One of the distinctive symptoms is partial wilting and premature yellowing of leaves. Leaves on one side of the plant or even a half leaf may show wilting symptoms. The vascular tissues show a brown discoloration when cut. The primary and secondary roots may become brown to black. Bacterial wilt is widespread in tropical, subtropical and warm temperate areas throughout the world. Its occurrence has now also been reported from temperate zones. In Africa it has been reported in Angola, Burkina Faso, Burundi, Congo, Ethiopia, Gabon, Gambia, Kenya, Madagascar, Malawi, Mauritius, Mozambique, Nigeria, Reunion, Rwanda, Senegal, Seychelles, Sierra Leone, Somalia, South Africa, Swaziland, Tanzania, Tunisia, Uganda, Zaire, Zambia and Zimbabwe (CABI, 2005). The bacterium is a quarantine organism. The occurrence of different races and strains of the pathogen with varying virulence under different environmental conditions presents a serious danger to European and Mediterranean potato and tomato production. Absence of the bacterium is an important consideration for countries exporting seed potatoes. Primary hosts: Lycopersicon esculentum (tomato), Nicotiana tabacum (tobacco), Solanum melongena (aubergine), Solanum tuberosum (potato), Musa (banana), Musa paradisiaca (plantain) and Heliconia. Secondary hosts: Anthurium, Ricinus communis (castor bean), Zingiber officinale (ginger), Arachis hypogaea (groundnut), Capsicum annuum (bell pepper), Colocasia esculenta (taro), Curcuma longa (turmeric), Gossypium (cotton), Hevea brasiliensis(rubber), Ipomoea batatas (sweet potato), Manihot esculenta (cassava). Wild hosts: Solanum nigrum (black nightshade), Galinsoga parviflora (gallant soldier), Portulaca oleracea (pussley), Urtica dioica (stinging nettle). The disease causes rapid wilting and death of the entire plant without any yellowing or spotting of leaves. All branches wilt at about the same time. When the stem of a wilted plant is cut across, the pith has a darkened, water-soaked appearance. There is a greyish slimy ooze on pressing the stem. 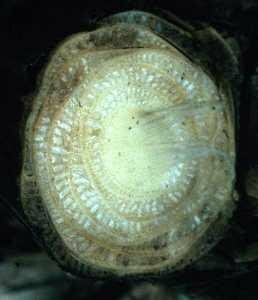 In later stages of the disease, decay of the pith may cause extensive hollowing of the stem. Bacterial wilt causes no spotting of the fruits. Affected roots decay, becoming dark brown to black in colour. If the soil is moist, diseased roots become soft and slimy. Water test for detection of bacterial wilt. Note bacterial strands oozing from infected tissue. Water test: To distinguish this wilt from others, take a thin slice or sliver of the brown stem tissue and place it on the inside of a glass of water at the water level. If bacterial wilt is present, a milky bacterial stream (strands) flows from the lower cut surface of the sliver within seconds. 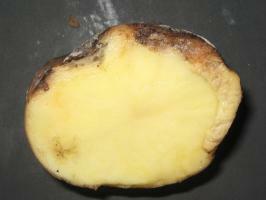 Bacterial wilt of potato: The infested leaves wilt during the (sunny) day and sometimes recover during cool hours. The wilting is similar to the result of lack of water. 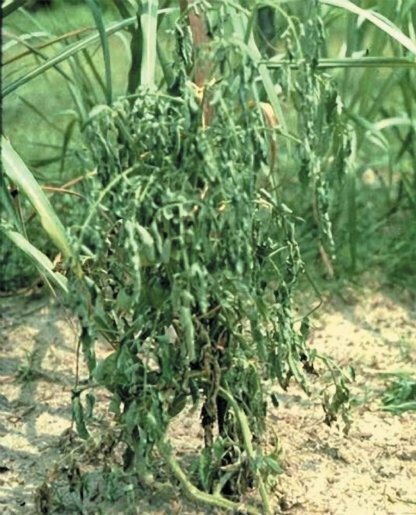 During the rapid development of the disease, the entire plant wilts quickly without yellowing. Othersymptoms could be wilting of only a part of the stem, or one side of the leaf/stem. The stem wilts or dries up completely and the remainder of the plant remains healthy. When the diseased tuber is cut, it shows a browning of the vascular ring and the immediate surrounding tissues On the cut surface, a creamy fluid usually appears on the vascular ring. 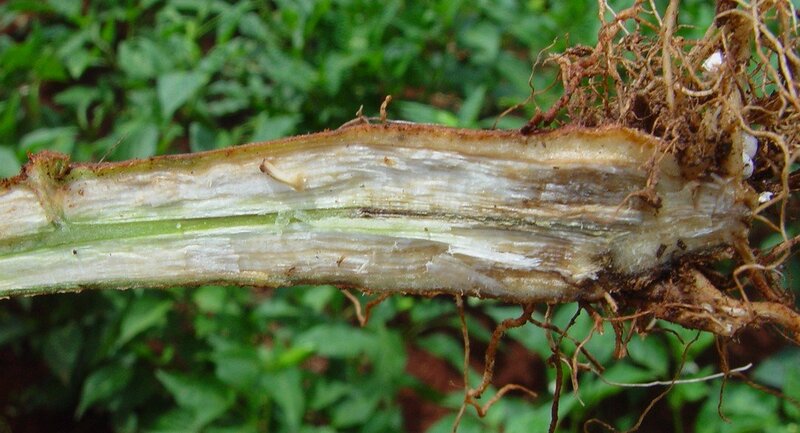 Bacterial wilt of tomato/eggplant: The initial symptom is a wilting of the terminal leaves, which after 2 to 3 days becomes permanent when the whole plant wilts due to the active development of the disease. Then the whole plants wilt and die suddenly. Total collapse of the plant usually occurs when temperatures reach 32degC and above. Plant wilts while still green. In the case of a slow development of the disease, the plant stunts and produces large numbers of adventitious roots on the stem. Bacterial wilt diagnosis in the field can be done easily. Cut a piece of the stem 2 to 3 cm long from the base. 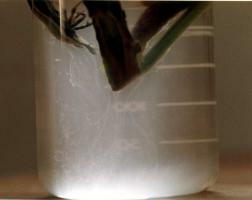 Suspend the cut stem in clear water in a glass container. Hold the stem with an improvised tong to maintain a vertical position. Within a few seconds, milky bacterial threads are discharged from the cut stem. Initially one of the youngest three leaves turns pale-green or yellow in colour and breaks down at the petiole and the pseudostem. Later all the other leaves collapse around the pseudostem. An infected finger or fruit shows dry and rotted pulp that is coloured brown or black, and the presence of bacterial discharges. Leaves, roots, seeds, fruits, stems, vegetative organs and whole plant. Stems: internal discoloration; creamy exudates; wilt. Whole plant: plant death; dwarfing. The bacterium is soil-borne and can survive in soil for long periods. However, some soils are conducive to bacterial wilt and other suppressive. Important soil factors affecting the occurrence and persistence of the pathogen are soil moisture and antagonistic microorganisms. Soil type influences soil moisture and population of antagonistic microorganisms, which in turn affect the survival of R. solanacearum in soil. 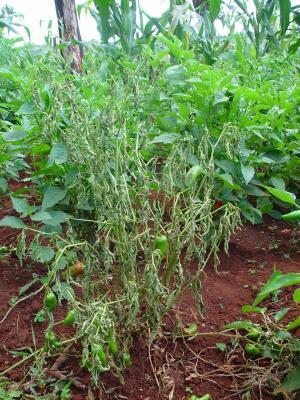 Bacterial wilt (R. solanacearum) has a very wide host range and infects all nightshade plants (members of Solanaceae). Weed hosts include black nightshade, lantana and Jimson weed. It infects plants through roots. As the roots of wilted plants decay, the bacteria are released back into the soil. Infestation by root-knot nematodes aggravates the disease. The bacterium is especially destructive in moist soils at temperatures above 24deg C. It is sensitive to high pH (alkaline soils), low soil temperature, low soil moisture and low fertility levels. Spread is effected by running water, movement of infested soil and also diseased seedlings. Bacterial wilt can also be spread on vegetative propagating material. Therefore, plant quarantine of potentially infested plant material is very important to avoid long-range dispersal. 1. Crop residues infected with Ralstonia solanacearum left in the field . Further below you find concrete preventive and curative methods against Bacterial wilt. Use plant varieties that are tolerant / resistant to bacterial wilt. In Kenya, the following tomato varieties have been claimed to be resistant to bacterial wilt: "Fortune Maker", "Kentom", and "Taiwan F1". Do not grow crops in soil where bacterial wilt has occurred. Good results have been encountered in Australia, the US and the Philippines by using "Biofumigation" as soil treatment for bacterial wilt. Since high soil temperatures and soil moisture enhance bacterial wilt development, damages can be minimized by changing the date of planting, considering seasons which are less favourable for disease development. In some developing countries intercropping has been used as a means of reducing pathogen populations in the soil and root-to-root transmission. 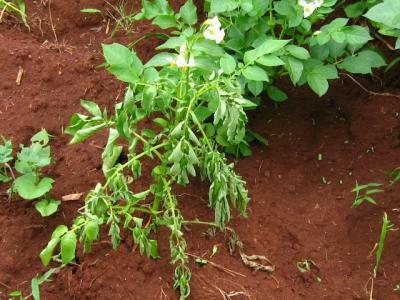 In Burundi, growing potato with bean showed a lower incidence of bacterial wilt, indicating that a bean intercrop, which has a dense root system and grows quickly, was better than a crop such as maize, which develops slower and has a more dispersed root system. Beije C.M, Kanyagia S.T., Muriuki S.J.N., Otieno E.A., Seif A. and Whittle A.M. (1984). Horticultural Crops Protection Handbook. National Horticultural Research Station. Thika, Kenya. Hayward, A.C. (1991). Biology and Epidemiology of Bacterial Wilt caused by Pseudomonas Solanacearum. Annual Reviews Phytopathol. 29: 65-87.